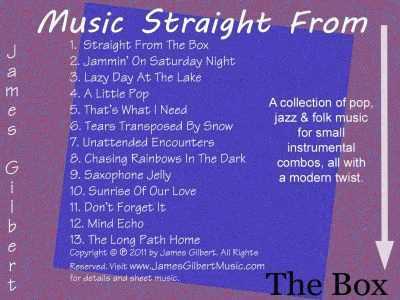 This 2011 audio CD from James Gilbert is a departure from his first CD, Travels Of The Heart. This CD consists of a variety of instrumental combos consisting of rhythm section, solo instrument and sometimes additional accompanying instruments. The styles include popular, jazz and folk all with a modern twist. This CD can be purchased at CD-Baby, iTunes, Amazon and GooglePlay. Everyone talks about thinking outside of the box. But, at some point, that outside of the box thinking or way of doing things becomes in the box and normal, everyday way of thinking of doing things. This CD contains songs that in some way or another were once considered anything but the normal way of doing things. Whether it is a particular combination of instruments, the type of instruments used or the way in which the music is composed, some element was at some time in the past -- and the not so distant past in some instances -- thought of as not the normal or accepted way of doing things. For example, as recently as the 1990's the idea of recording or mixing a CD entirely on a computer was not a normal way of doing things. This CD was recorded and mixed entirely on a computer. If you are listening to any of the tracks on an mp3 player, that itself was unheard of not that long ago. The mainstream use of synthesizers or samplers in music was once considered unusual, even unacceptable but is now more common than one might imagine. In addition to that idea behind Music Straight From The Box, the CD comes in a box, the computer it was produced on is sometimes called a box and the music is sometimes played through a boom box. 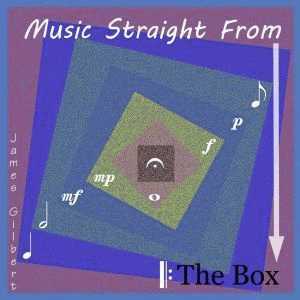 So you have Music Straight From The Box. All of our albums may be purchased via the links below. 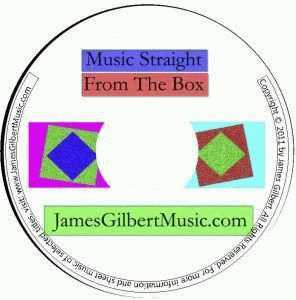 Sheet-music of selected tracks can be found in our music catalog. Artwork of the CD and back page shown below. This CD is available on iTunes, Amazon, CD-Baby and GooglePlay.